Tea tree oil is a potent medicinal essential oil. It must be used with care, especially around household pets. Here’s how to safely use tea tree oil. Tea tree oil is listed by the website Top 10 Home Remedies as the most popular essential oil. Its antimicrobial properties make tea tree oil an easy choice for fighting illness. It’s called the “medicine cabinet in a bottle.” And yes, it is potent medicine. It must be used carefully. I’ve used it for years, and I’m happy to share with you how to safely use tea tree oil. Essential oils are a highly concentrated version of the oils in a plant extracted through distillation. Some plant oils are very potent. For example, the oil of the poison ivy leaf is what causes you to break out in a rash just from touching it. Now imagine what an essential oil, a highly concentrated oil, from poison ivy could do! Tea tree oil is antimicrobial. It kills bacteria, viruses, and fungi. It is also anti-inflammatory, a stimulant, expectorant, and a natural insecticide. Tea tree oil treats a myriad of topical ailments including acne, dandruff, ear infections, insect bites, head lice, and warts. Its antioxidant properties help heal scars, prevent wrinkles and age spots, and is effective against psoriasis and eczema. Many, many plants contain medicinal properties. Essential oils allow us to access those healing properties in a convenient form. Tea tree essential oil is made from the Melaleuca alternifolia leaf, and that is why tea tree oil is sometimes called melaleuca oil. This plant is native to Australia. It’s called the Tea Tree and its leaves have been used by aborigines for medicinal purposes for centuries. I use tea tree oil to clean and disinfect my home. It has a slight camphor fragrance that mixes well with lavender and lemon essential oils leaving my home smelling fresh and clean. I also use it in my diffusers to help fight airborne viruses during cold and flu season. We raise cattle. One of our heifers developed these awful red streaks on the inside of her back legs. The usual veterinary treatments for parasites didn’t help. So I mixed up a bowl of coconut oil and tea tree oil. My husband and I put on latex gloves and rubbed the mixture well into the affected area. After three applications, her skin cleared up. We think she had a yeast infection between her legs and udder due to the wet spring. The combination of the medicinal properties of tea tree oil and coconut oil are effective against fungal infections. First, NEVER INGEST TEA TREE OIL. Ingesting tea tree oil causes confusion, hallucination, drowsiness, unsteadiness, severe rashes, diarrhea, and liver damage. It is safe for treating vaginal infections, ear infections, and sinus infections. But tea tree oil should never enter your digestive system. In fact, due to the potency of essential oils, I won’t ingest any of them. Yes, some say you can. I don’t care. I’m playing it safe and just using them topically, in a diffuser, and to clean my home. Tea tree oil is toxic to dogs and cats. According to the Healthy Paws Pet Insurance blog, commercially made pet shampoos containing tea tree oil dilute the tea tree oil to such a small percentage of the product that it’s safe to use on pets. But never use tea tree oil, especially in undiluted form to treat a wound, skin problem, or parasite issue on a dog or cat. When diffusing tea tree oil with a pet in the home, be sure to only use one drop per cup of water in your diffuser. I diffuse tea tree oil in my house during the winter (1 drop per cup of water) with no problems for my 70-pound dog. When I used tea tree oil to treat our heifer, it was diluted in coconut oil. A teaspoon of diluted tea tree oil used topically on a 1,000-pound heifer does no harm. Right now, there is no evidence of tea tree oil interaction with any medication. But the reason for the lack of evidence is likely due to a lack of research. Talk with your doctor if you use any medications that you think may interact with tea tree oil and follow his instructions. Pregnant and nursing women should not use tea tree oil. 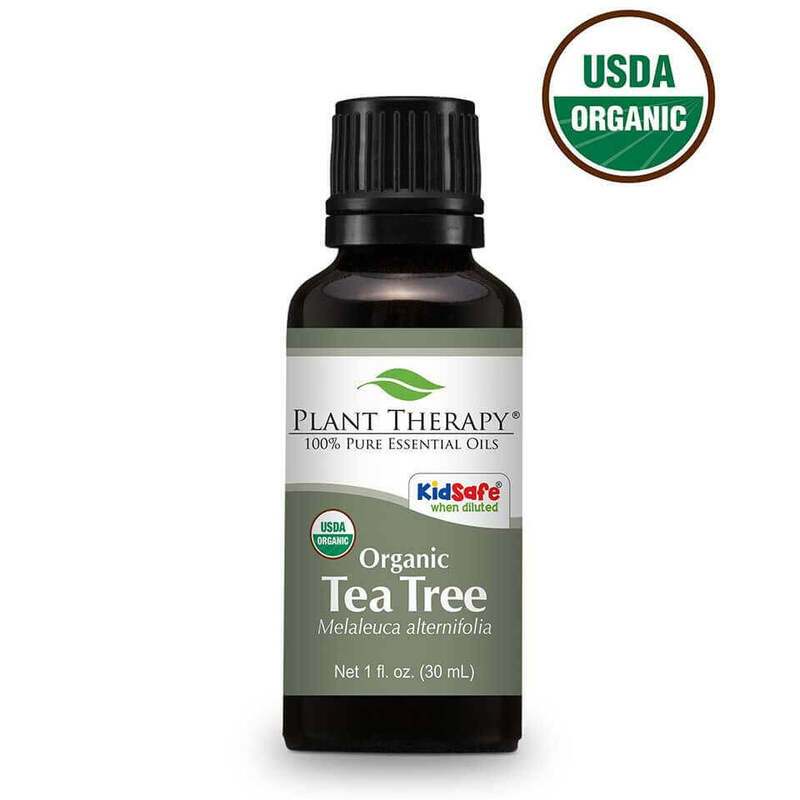 Plant Therapy has a line of essential oils called Kid Safe specifically formulated for children ages 2-10. I recommend this line for anyone looking for a tea tree oil or any essential oil for use on children. As with any essential oil, dilute tea tree oil in a carrier oil before using it. Good carrier oils that are easy to find are coconut oil (both solid and fractionated), olive oil, avocado oil, almond oil, and apricot oil. I’ve used tea tree oil up to a 1:1 dilution with no problems. Just be sure you have at least as much carrier oil as you do tea tree oil when diluting it for use. When I feel a cold coming on, I add just one drop to the solution in my 8-ounce neti pot and rinse my sinuses. The antimicrobial properties help fight the cold virus present in the sinuses and also any bacteria that may cause a sinus infection. A couple of drops of tea tree oil diluted in a liquid oil and placed in the ear canal with a dropper can help heal an ear infection. Treat skin tags with diluted tea tree oil on a cotton ball bandaged to the area to keep it in contact with the skin tag until it clears up. Tea tree oil is touted as effective in removing warts. Every resource I’ve checked for using tea tree oil to remove warts says to use the tea tree oil undiluted. Warts are caused by a viral infection and tea tree oils antiviral properties should be effective against warts. Tea tree oil is a wonderful natural remedy for a number of ailments. I use it a lot in my home. If you want to know more about using essential oils safely, I recommend the Herb and Essential Oils Ultimate Bundle. It’s an e-library of information about how to use herbs and essential oils safely and effectively for your home and family. Very good information and it may be a good idea to include it in my wellness kit especially in cold weather like this. Thank you, Dani! I keep it on hand at all times. I absolutely love tea tree oil. The smell of it and all it’s medicinal qualities are phenomenal. Thanks for this post.